We've been to Tilly sur Seulles! 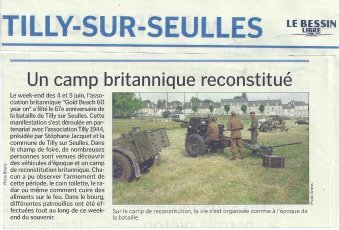 Well, sixty-odd of us went, supported by a group of French (US) re-enactors in one corner of the field. All went pretty well, despite a spectacular thunderstorm on the Saturday evening, and a grey, drizzly day on the Sunday. Attendances were generally pretty good, certainly good enough to encourage further ventures inland in future! 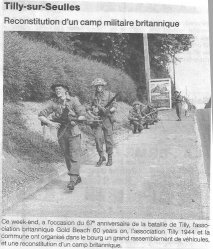 Thanks to all who attended, Gerald from LTF and the folks of Tilly sur Seulles for their help. Here are a few pictures, or links to pages of pictures. As usual, click on a thumbnail to open a bigger picture in a new window. Click any of the links below to open a new page..